Underwater photography is a unique field. Many divers find that their diving experience is improved ten-fold once they have learnt the basics of underwater photography and are able to take a camera down with them to record the sights. This particular type of photography requires some extra knowledge, however. Not only must you be proficient in the basic operation of a camera, you must also be able to tackle the unique environment and all of the new variables that this entails. In the first instance, it is important to remember that you will require some specialist equipment if you wish to take photos on a dive, or while snorkelling. There are a number of options available in this field. 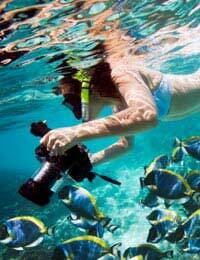 Separate waterproof shells are now available for many commercial ‘point-and-shoot’ digital cameras. Indeed, these are going down in price all the time; they are likely to set you back around £100. However, while these are sufficient if you wish only to take snapshots, you are likely to find that cameras of this type produce sub-standard results as they are not designed for underwater use. Underwater photography presents a number of unique problems. Amongst these is the magnifying nature of water. When you take a photograph in water, you will find that everything appears larger in the viewfinder than it would if you were on land. This is because water magnifies by nature. As a result, you are likely to need a wider angle lens than that which you would normally use. Point-and-shoot cameras frequently do not offer sufficient width. As such, you may well find that you need to use an SLR with a wide-angle lens to produce the best results. Currently there are no SLRs available that come ready-packaged for underwater use – at least not affordably. There are, however, a number of options for the protection of your gear. Some specialist companies now make casing for SLRs, but you will need to know the dimensions of your lens before you buy. This is an expensive option. Alternatively, it is now possible to buy special waterproof plastic bags into which any camera will fit. These bags have watertight metal closures to ensure that water does not seep in. Many underwater photographers have found, however, that this is not a valid option for depths over around 30 feet, as the pressure exerted renders the camera inoperable; the bag shrinks around the camera to such a degree that the lens is not movable. If you are just snorkelling, or shallow diving, however, a specialist watertight bag may well be the best option. It should also be noted that underwater photography poses problems for exposure and saturation. When you view your images you may well find that the colours are ‘muddy’ and indistinct; this is because, while your eyes adjust fairly quickly to the blue tint, your camera will not. This can frequently be fixed with the creative use of some image editing software; you may wish to read the articles on digital processing elsewhere on this site for some help with ensuring that your final images are as successful as possible.